This fully furnished apartment lies on a peaceful side street in the uptown district of Klein Flottbek bordering Jenisch Park and just 5 mins from the Elbe. The apartment has its own entrance and offers quick public transport links into the city centre. The apartment is newly renovated, bright and welcomingly furnished. 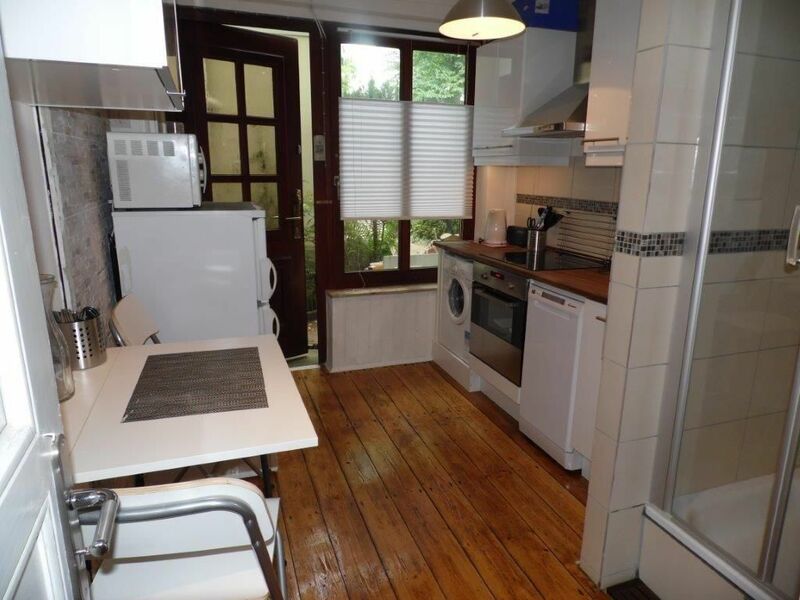 The kitchen has an oven with a ceramic stove, dishwasher, washing machine, fridge-freezer, microwave, Senseo coffee machine, regular coffee machine and a kettle. The kitchen leads to a shower room with a glass cubicle. A tankless water heater provides access to hot water at all times and there is a breakfast table with two chairs. In the living room there is a nice, read leather couch, a glass table and a comfortable leather chair with pouffe. The LCD Flatscreen TV and DVD player are concealed in a cupboard. A small oven is available for use and a small separate toilet can be reached via the living room with steps leading up into the bedroom. The first floor bedroom is kitted out with a 1.4 meter wide bed, a wardrobe and a washing cupboard. A ceiling fan will help keep things cool and fresh. In front of the apartment is a small bank. The exterior is illuminated at night via motion sensors and a parking space is available upon request. Firewood for a small oven available for free on request. Ich habe hier sehr gerne gewohnt und sollte mich mein Weg wieder in diesen Teil Hamburgs führen wird diese Wohnung meine erste Anfrage sein. Ideal für Leute, die mit Hund reisen. Ideal für Leute, die mit Hund reisen. Sehr grosse und schöne Grünflächen in unmittelbarer Umgebung. Der Kontakt zu den Vermietern ist sehr unkompliziert und freundlich. Eine kleine liebevoll eingerichtete Wohnung, perfekt für ein Paar, in ruhiger Lage. In unmittelbarer Nähe kann man super Gassi / Spazieren gehen, in 5 min ist man an der Elbe oder an der Haltestelle um zB in die City zu fahren. Der Kontakt zum Vermieter war sehr nett und unkompliziert. Schöne Wohnung. Geniale Lager. Hat unseren Hamburg Aufenthalt total abgerundet. Eine sehr schöne kleine Wohnung und durch das sehr nette Entgegenkommen des Vermieters war es trotz einer nicht Barrierefreier Wohnung uns möglich, einen fantastischen Kurzurlaub zu verleben! Die Empfehlung der Restauranta und Sehenswürdigkeiten in Nähe Dank der Vermieter wurde es für uns unvergessen mit Hund!!! Vielen Dank, wir würden gerne wiederkommen! The apartment lies in the green belt of west Hamburg, a stone’s throw away from Ernst Barlach House and Jenisch House and a five minute walk from the Elbe and the ‘Teufelsbrück’. There are plenty of parks nearby, which make for a pleasant stroll along the Elbe in the direction of the Hafencity or Blankenese. The botanical garden is just 10 minutes away. There are also ten restaurants nearby, as well as the Elbe Shopping Centre which is just a short drive away.